TowBoatU.S. Grand Lake has been in business since 2011, and has performed thousands of successful towing, salvage and marine assistance operations over the years on Grand Lake O' the Cherokees. We are committed to providing prompt, professional and timely assistance to all customers with a keen eye toward safety using state-of-the-art equipment and experienced crew. We provide immediate response services, marine towing, ungrounding, and fuel delivery for both BoatU.S. members and non-members alike. Run out of fuel? We offer fuel delivery services and always keep 10 gallons of fuel on board to assist boats in need. Dead battery? No problem. We offer on the water jumpstarts to get you going again. We provide immediate response services for boaters, such as salvages for boats hard aground requiring more than one vessel or special equipment to re-float it. Immediate response services are not covered under your routine BoatU.S. towing service agreement but they are typically billed to your insurance company under your hull insurance policy. Is your vessel taking on water and you need it pumped so you can get it back to the dock or shore? We offer a wide selection of pumps for any size boat to adequately dewater your vessel so it may be taken to a location for service or repair. Why become a BoatU.S. member? The service is good on all boats you own, borrow or rent. 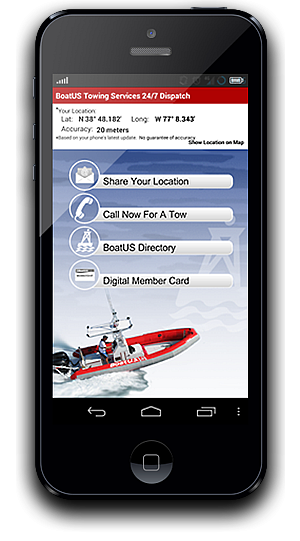 You are eligible for the highest level of rewards at West Marine stores. Be sure and ask TowBoatU.S. Grand Lake about member benefits for local savings as well. *Some restrictions may apply, Please visit boatus.com for all guidelines of eligibility.